Vodafone has made deals with partner carriers in the UK, New Zealand and United States to offer Australian customers a roaming plan that allows them to use their phones while travelling as if they were still in Australia. The deals, made between Vodafone Australia and partners Vodafone New Zealand, Vodafone UK, and AT&T in the US, apply only to a new range of “Roam Like Home” mobile phone plans that the company will release within the next month. Current customers will have to re-contract or switch plans, at the discretion of Vodafone, to access the roaming service. The service is enabled by default for customers of the new plans — when using their mobile phone internationally, a $5 charge will be ticketed per day of use, and the data, calls and text messages sent will be charged according to the rates of the customer’s existing plan. This means that incidences of ‘bill shock’ should be greatly reduced, with mobile usage even in excess of each plan’s maximum usage allowance being charged at Australian rates. The specific data, text and call allowances of Vodafone’s new Roam Like Home plans are not yet known. Vodafone Australia CEO Bill Morrow says that the roaming deals “didn’t really take much effort”, and jokingly told media that he hoped local competitors Telstra and Optus “never” put similar deals in place with their international partners. 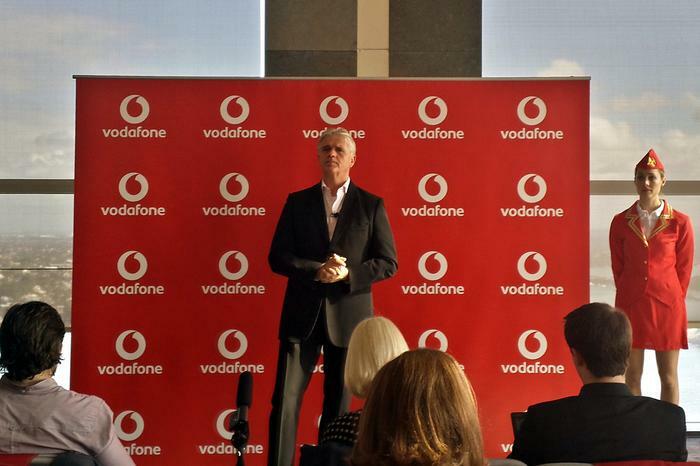 Vodafone CEO Bill Morrow announcing the Roam Like Home plans. Morrow said that without the Roam Like Home offer, customers roaming are often liable for international data rates of up to $20,000 per 1GB of data — including on Vodafone’s own network. The cheapest roaming bundle that Vodafone offers on its current mobile and data plans varies per country, with European roaming costing at least $50 for 100MB of data. Data not covered by a roaming pack costs 1c per kilobyte, effectively $10 per megabyte or $10,000 per gigabyte. Vodafone’s customer help forums have several incidences of customers reporting excess data usage charges in the range of thousands of dollars after international trips. The company says it plans to roll the roaming services out to more locations around the world, but didn’t provide a time-frame. Vodafone Group, which owns 50 per cent of Vodafone Australia, also controls mobile networks in locations as diverse as Ghana, Qatar, the Czech Republic and Albania.